For 364 days of the year, the two-and-a-half-mile stretch of one-lane gravel road that I live on is relatively quiet. 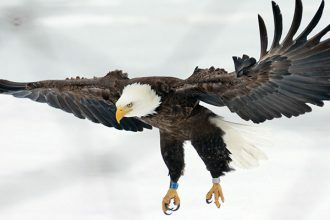 Yesterday was the exception so I decided that it was time to grab some cameras and get outta Dodge. So I drove to Pennsylvania to trace the flow of the Genesee River, which is something that I’ve wanted to do for years. I took this photo from a bridge in Genesee, Pennsylvania, not far from the river’s source in a pasture in Ulysses, where you can actually step across it. 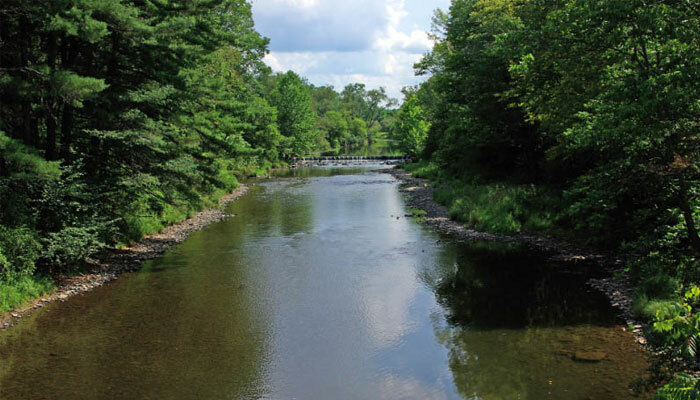 This photo shows the river where it enters New York State near the hamlet of Shongo. The upper reaches of the Genesee are excellent trout waters and I found a number of places where I plan to give it try with a fly rod this fall and next spring. 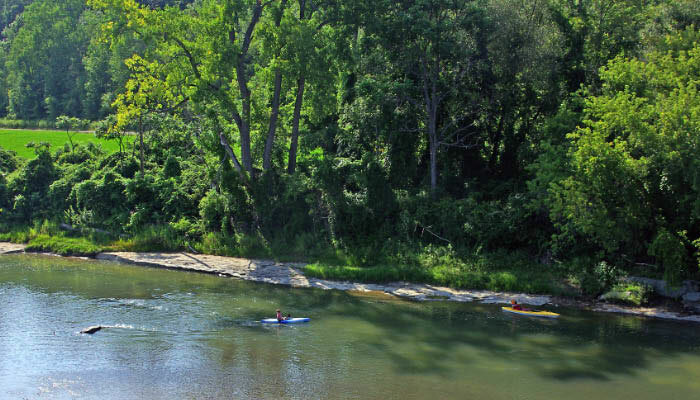 We’ll trace the 157-mile long Genesee River as it trickles out of Pennsylvania and empties into Lake Ontario in northern New York. 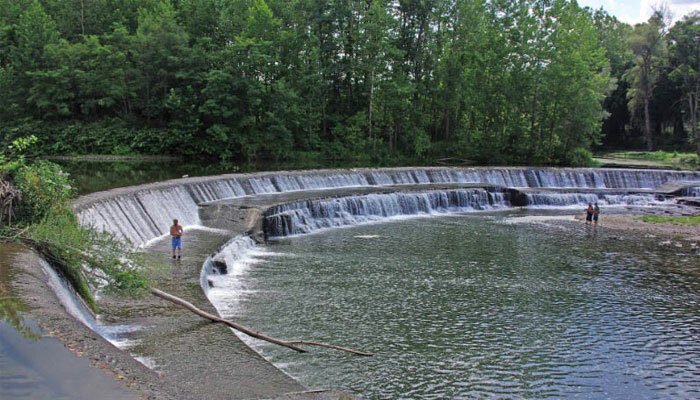 Most of the Genesee River flowing between Belmont and Portageville is flat and navigable, and — except for the fish weir shown in this image, which is designed to prevent warmwater fish species like bass and pike from migrating upstream into trout waters — is free from rapids and waterfalls, making the Genesee an ideal place to canoe and kayak. I photographed these kayakers from a bridge just south of Portageville, which is located near the halfway mark of the Genesee River’s 157-mile length. The water level is somewhat lower than normal because of the recent dry spell. The temperature was in the mid-80s on Sunday and this family, along with the family dog, took advantage of the river to cool off. I was surprised to find fewer than a dozen people along this 50-plus mile stretch of river, despite its sparkling clear water and numerous points of access. 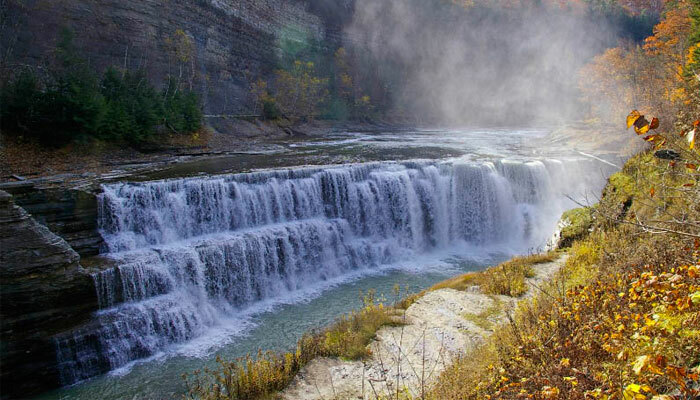 The most-famous section of the Genesee River is the 17-mile stretch that runs through Letchworth State Park, where it has carved a gorge approaching 600 feet deep. 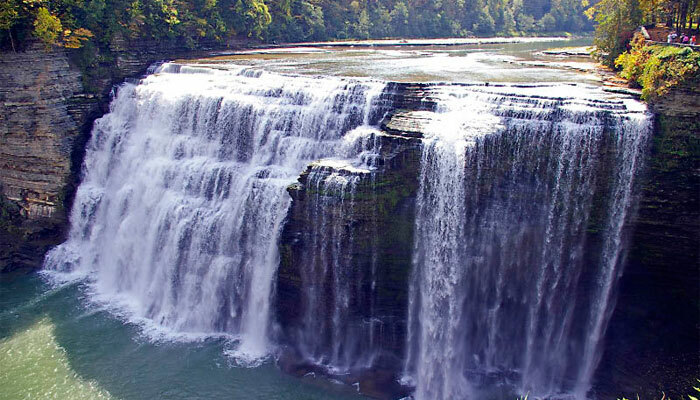 Known as the “Grand Canyon of the East”, Letchworth was recently voted the number one State Park in America and features three major waterfalls. 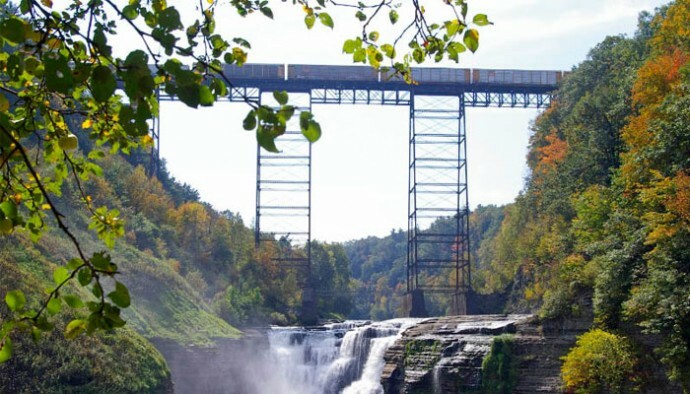 This image, taken in 2010, shows a train crossing the railroad trestle above the 70-foot high Upper Falls. cascades 107 feet. Both falls are easily accessible and easy to photograph from a number of vantage points. Getting to the Lower Falls, another 70-foot cascade, is different story, which requires descending a 127-step stone stairway from the parking area above. And that means ascending 127 stone stairs to get back to your vehicle. It’s a workout but, as you can see, the view is worth it. The Mt. Morris Dam, at the northern terminus of Letchworth State Park, was completed in 1952. It was built to prevent flooding in downstream communities, including Rochester. At 230 feet high and 1,028 feet wide, it is the largest concrete flood control dam east of the Mississippi. 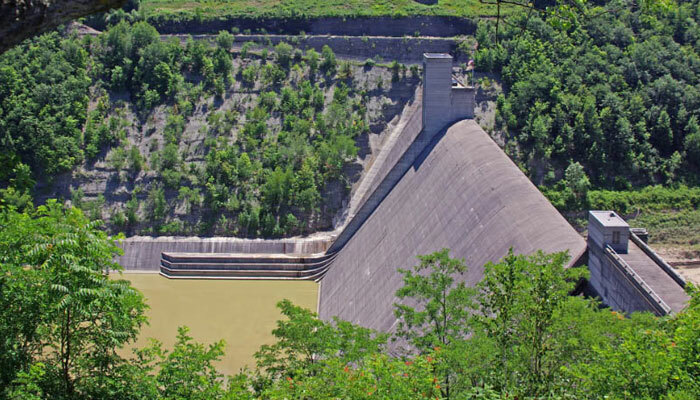 Its flood control reservoir is the entire 17-mile length of the Letchworth State Park canyon. In 1972, torrential rains from Hurricane Agnes filled that reservoir to within 4 feet of the top of the dam. 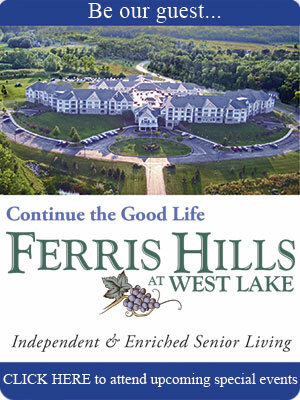 The first major population center that the Genesee River flows through as it winds its way toward Lake Ontario is the village of Wellsville, which is eight miles north of the NY/PA state line. It looks more like a canal than a river there because of the concrete waterway that was built to channel its flow through the village after an historic flood in 1972. It’s not at all picturesque so I didn’t take any photos there. 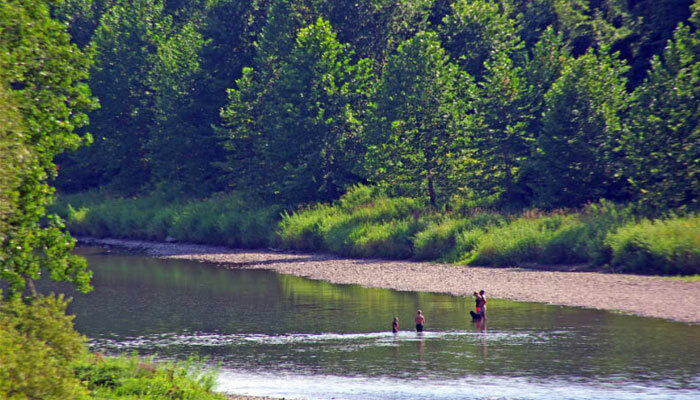 I found these three men fishing below the dam in Belmont, a few miles downstream from Wellsville. The Belmont Dam is part of the same flood control project that was built following the flood in 1972. 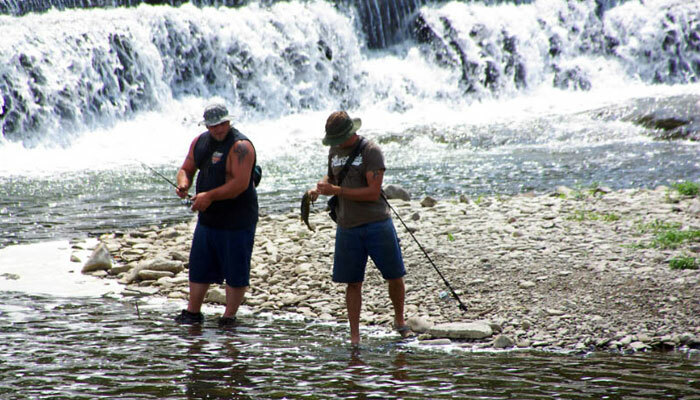 The temperature was in the mid-80s and these fishermen found a way to cool off while enjoying their pastime. One fellow had some luck while I was there, catching and releasing this 12-inch smallmouth bass. 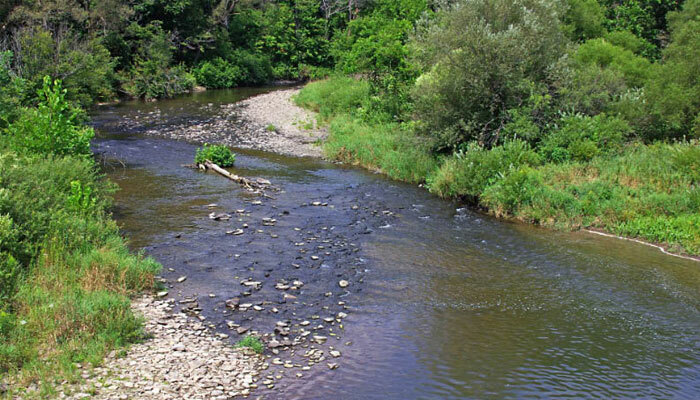 Even though the upper Genesee is classified as a trout stream, some warmwater species are also present. I took this photo from a very nice wheelchair-accessible ramp and fishing platform that enables anyone with a physical disability to enjoy fishing the river as well. 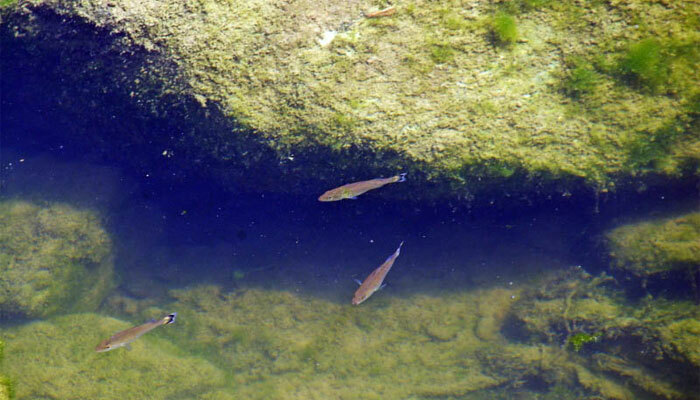 Before leaving, I looked down into a pool of still water and spotted these three immature smallmouth bass swimming among the boulders. empties into Lake Ontario. I bypassed a 50-mile stretch of river because I do not have any images taken between Letchworth State Park and the mouth of the river–something that I plan to rectify soon. 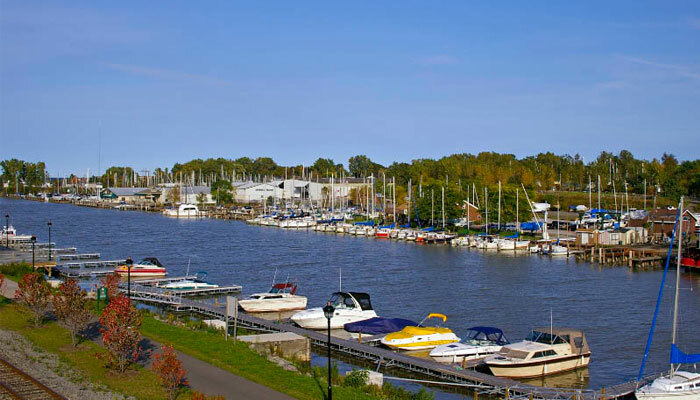 This portion of the river is home to a number of yacht clubs and pleasure boat marinas. 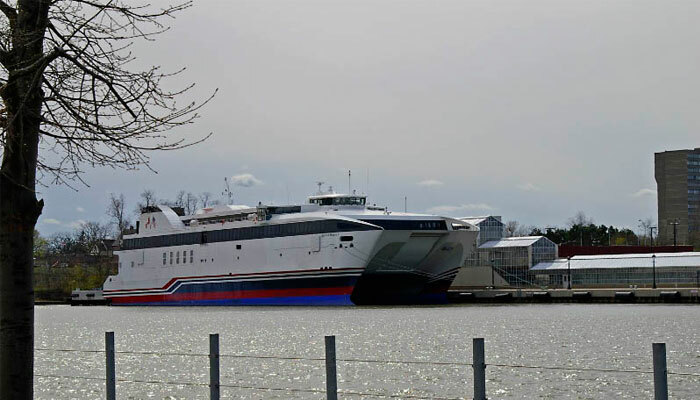 This photo, which I took in 2005, shows the Rochester-to-Toronto Fast Ferry, nicknamed “The Breeze”, docked at the Port of Rochester. At 284 feet in length with a 78-foot beam and standing 5-stories above the water, it was an ambitious but short-lived endeavor that proved to be financially unsustainable. The ship was subsequently sold to an operator in Australia, where it remains in service today. At this point, the Genesee River is 300 yards wide and 27 feet deep. 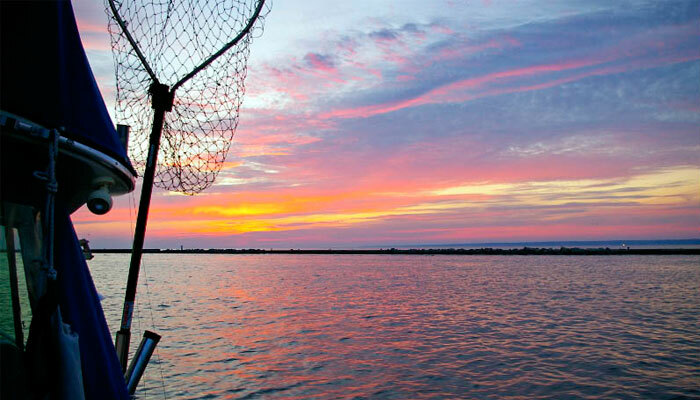 This image, taken from a charter fishing boat at sunrise in late August 2008, shows the Summerville Pier on the starboard side of the Genesee River where it empties into Lake Ontario. The Charlotte Pier is on the port side. 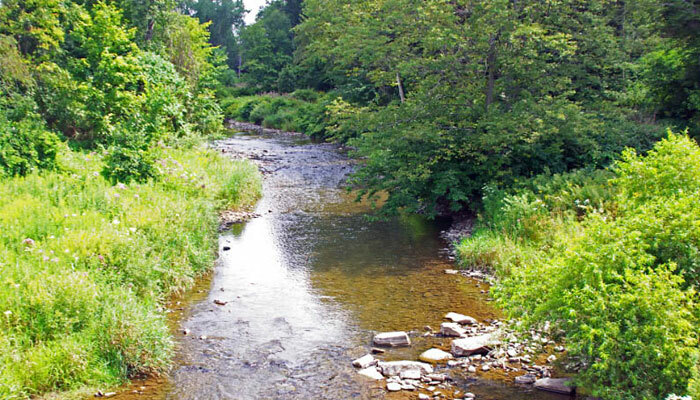 This photo shows the mouth of the river 157 miles downstream from its source in Ulysses, Pennsylvania. In 2009, I won an award from the New York State Outdoor Writers Association for this image.